A GSM connected dual port power switch with the convenience of a C13 style power sockets. Text alerting if the power is lost or restored. No PC or network needed. Tired of driving there just to press a button? Distance is no object, switch power anywhere there is a mobile phone signal. Control Appliances Remotely by Text! Saves you time and money, cut energy usage, reduce your carbon footprint. The Powertxt Duo lets you schedule, check status and switch power On and Off by text message, it even tells you if power is lost! 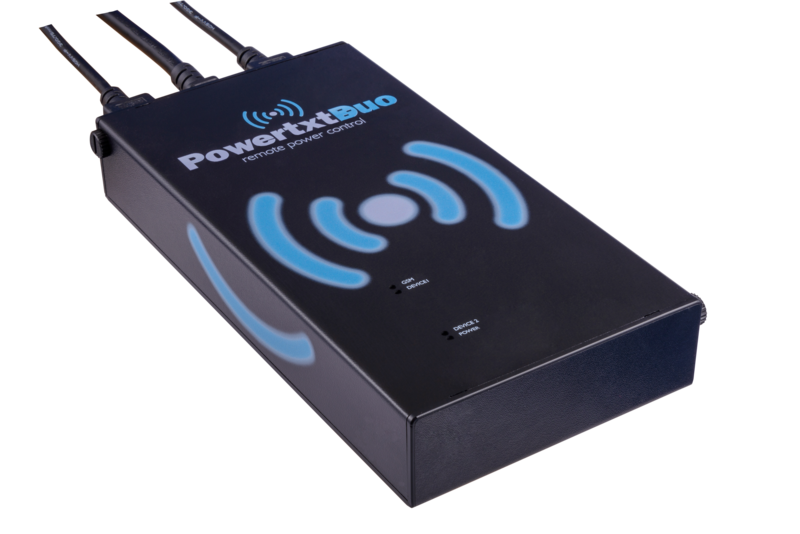 Announcing the Powertxt Duo GSM Two Port Power Switch The Powertxt Duo is a new two port GSM based power switch. You can switch on / off your equipment just by using your mobile phone. The power switch is completely out of band. It requires no networking, and does not require an IP address. All you need is a SIM from your favourite mobile phone network and you are ready. The Powertxt Duo takes up to two C13 kettle style leads.